Bread and salt is one of the most common greeting gestures in Eastern European, mostly Slavic countries. It’s a common gesture when admired guests (politicians, businessmen, famous people) arrive to a Slavic country. In many countries, especially Western Slavic countries, this tradition is partially lost while it’s still very common among Eastern and some South Slavic nations. 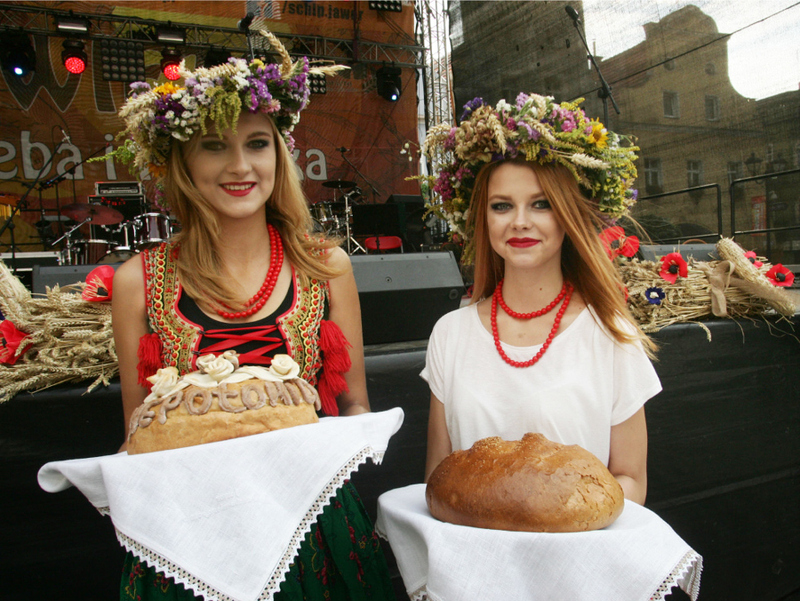 Guests would be greeted by a young woman dressed in their national folk costume, holding a embroidered towel (rushnik, ručnik) and a loaf of bread placed on it. 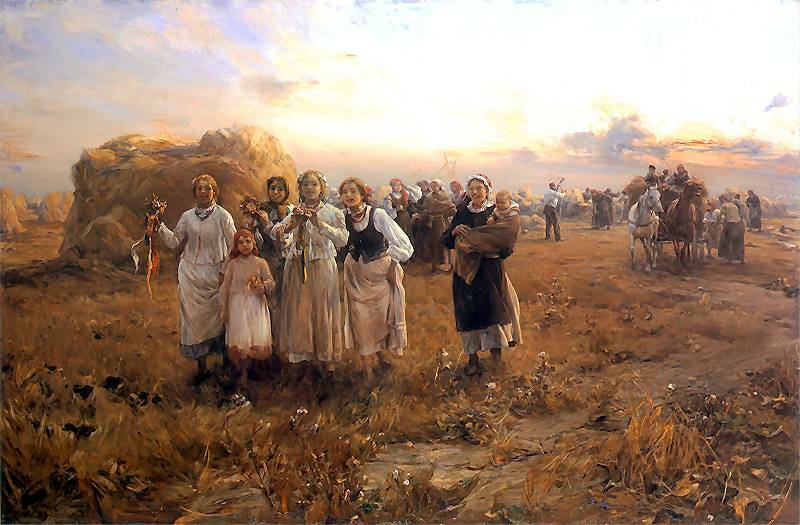 Slavic folk culture always seen fruits of agricultural labor as wealth, especially influenced by Christian beliefs over time as well, so offering guests a loaf of bread was common greeting in old times while today it’s mostly ceremony. Tradition was gradually also adopted by three non-Slavic nations — Lithuanians, Latvians (both Baltic) and Romanians (Latin). Bread is still to this day one of the most favorite daily food that we use, so this sacred symbolism of bread because of Christianity and our daily need for such product is why bread has very important place in Slavic culture. There are some superstitions across Slavic lands which say that throwing old bread is a sin and it will bring hunger and bad luck to a person that did it. This is of course a Christian view on bread as the body of Christ, and as such you have to consume it completely while throwing it away is a act of sin or in other words rejecting body of Christ. There is a festivity in Slavic countries when people celebrate bread. In that time most schools have events that encourage kids to bake their own bread and share it with their school friends in various artistic forms. There are contests on prettiest decorated breads and alike. It was said that in old times people would also gift each other small baked breads so they would protect them from bad luck, misfortune and it would bring wealth to them. They would even bring it traditionally when a new house was built to bring luck and prosperity to it’s owners. Baking bread in old times was an act that would be done over the weekends. Households would bake larger number of breads to last them a whole week, keeping them fresh in special rooms made for storing them. Of course baking them was a special rite and fun for the family as well. They weren’t just a plain food, it was an art where people loved to decorate their daily bread with various symbols. Most common ones were again Christian ones, with large cross above the top of the bread crust. This act also had a lot of symbolism during it’s performance from the way you hold the knives when cutting the bread or god forbid it fell to the ground from your hands. Someone in house will die if: a bread during baking would get a huge deep crack in crust. Agricultural era has long time died out, after modernization of such processes making bread is no longer considered a hard work. There are harvester cutting the crops, automated machines picking it, organized transports transferring the wheat or corn, large industries baking bread…the magic was lost. In old times where we had no machines it was common that the whole village would help each other to maintain fields as a larger group. To make the whole process much faster, this would be accompanied by a lot of singing, dances and Slavic rituals and traditions that we witness today. These days even in rural areas people buy bread, but tradition still remains in oral transmission, folk tales and some luckily alive festivities. Slavic people to this day still have great thankfulness for any fruits of manual labor and what earth gives us.